Alapaha Blue Blood Bulldogs weigh approximately 50-90 pounds (22-40 kg). Approximately 20-26 inches (50-66 cm) at the shoulders. Alapahas come in many different colours, including various shades of white, black, red, fawn, and brown. These dogs have white markings and are occasionally piebald spotted. Toenails should always be white to ensure you have a full-bred Alapaha Blue Blood Bulldog. Alapaha Blue Blood Bulldogs have short and stiff coats with soft undercoats. Alapaha Blue Blood Bulldogs are friendly animals that like to be treated as part of the family. Relaxed when not defending people or property, these dogs are very loving and like to receive plenty of attention from humans. Lana Lou Lane’s Alapaha’s almost all have Marcelle, Marble, and Van Shelton (three of her stud Alapaha’s) in their bloodline. 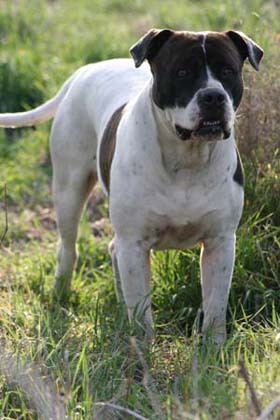 Lana Lou Lane used Catahoula Bulldogs, Colby Pitbulls, and Old Southern White Bulldogs to develop the Alapaha Blue Blood Bulldog. This rare and nearly extinct dog breed originated in the Alapaha region of Georgia, USA. Developed by the Lane family during the 1800’s, Alapahas were used on plantations as watchdogs. Today, there are less than 200 of these dogs in existence. This breed was named partly for the Alapaha region where it was first developed. An alternative name for this breed is Otto. Alapaha Blue Blood Bulldogs are easy to train and make excellent guard dogs and watchdogs. Aggressive only defensively, these dogs are very responsible with children and have big hearts. Alapahas are very people-oriented dogs that crave and demand attention from their human family members. Alapaha Blue Blood Bulldogs are very dutiful and easy to train. These dogs are quite active outdoors but relatively inactive indoors. Alapahas require regular exercise and should have at least an average sized yard. Alapaha Blue Blood Bulldogs were developed to provide both security and companionship, and they’re great at doing both. These big-hearted dogs love to be part of the family and require plenty of attention from their human family members. Alapahas are highly suitable for families with children and prefer to be indoor dogs rather than outdoor dogs. However, these dogs require regular exercise and are better suited for homes with yards rather than apartments.